Welcome to my CAD GXL1200 condenser microphone modification project. I found that by changing some components and doing a physical modification to the capsules I could make these microphones sound better. Click on any of the images to view them in higher resolution. After hearing recordings made by audio recording enthusiasts who had modified inexpensive microphones to make them sound better, I decided to try modifying some myself. 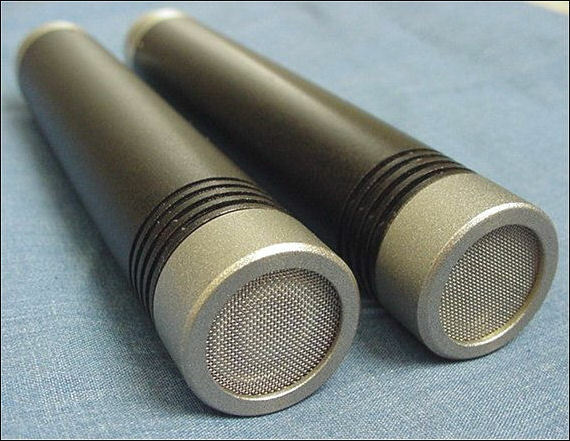 The stock microphones (right) have an overly bright and somewhat grainy sound to them. By reading on Michael Joly's Oktava Mod web site and on Gearslutz and The TapersSection Forums I learned that by changing some components on the circuit boards I could make these cheap microphones sound pretty good. I ended up doing more than just swapping out a few components on the microphones as I had first planned. I'll have more information about the physical modifications I did later. I found a pair of used CAD GXL1200 microphones on eBay for $63. After receiving and testing the microphones to make sure they worked, I opened them both up. The picture below shows what the top of the stock circuit board looks like when the metal body is removed. There is general agreement from nearly everything I have read online that changing the two ceramic capacitors C3 and C4 on the top side of the circuit and the one small ceramic capacitor C13 on the other side of the circuit board make the biggest difference in sound. I've acquired the tools and experience needed to solder and unsolder through-hole electronic components over the years, so changing components wasn't a problem for me. For this project, I bought components from Mouser Electronics and a local electronics warehouse based on what I read other people had used. I started by removing the three key components that needed to be replaced. While doing that, I noticed capacitors C3 and C4 were .47uf on one circuit and .22uf on the other. Then I started to wonder if there were any more irregularities between the components used in the two microphone circuits. I did find some of the values of the other components varied as well. I ended up pulling nearly every component off both circuit boards and replacing them with higher quality and better matched components. The ceramic resisters in the signal path got replaced with metal film types. The ceramic capacitors were replaced with metal film types and better electrolytic types. I hand matched all the components, to make sure both microphones had nearly identical parts. I used Teflon/silver wire to replace the jumpers on the back side of the circuit board and the wires from the circuit to the XLR connectors. The picture on the right shows what the circuit boards looked like after I was finished. I did notice a more open and less grainy sound from the microphones after the changes were made. Now, some information about the physical modifications I did. I actually modified the capsules before I did the electronics. As you can see on the picture of the stock microphone (top, right), the front of the capsule has a thick metal slotted grill over it. In order to accommodate that protective grill, the microphone designer incorporated a small chamber on the front of the capsule. Some DIY enthusiasts advocate for removing that chamber and the grill which they claim colors the sound and makes the microphones too bright. I got inspiration to do the capsule modification from reading this thread: http://taperssection.com/index.php?topic=127204.0 at the TapersSection Forums. On the second page of that thread, raymonda explains how he modified his capsules. I also shared some information on that thread as I progressed through doing modifications on my set of Chinese mics. I deviated from raymonda's procedure for removing the front chamber as I found his method more difficult to do. From the thread, I wrote, "I hand sanded the front chamber off with 80 - 220 grit sand paper. Then I wound some gaffers tape around the sanding attachment on my Dremel. I wound enough so I could slip the capsule housing over it with the capsule being tightly secured. Then I checked and adjusted the run-out until it was fairly even all around. I turned on the Dremel and ran it against increasingly finer sand paper until I got the thickness and chamfer that I wanted. I finished by running it against some Scotch-Brite. I measured everything and proceeded with the next one. It took 3 hours total." You can see the results on the right. When all the electronic and physical modifications were completed, I spray painted the bodies metallic bronze but left the XLR connector end and the capsules silver. I am quite happy with the completely finished microphones (below). I think they look sharp and sound better than they did off the shelf. I use them mostly as a pair of back-ups. However, I find I can make good recordings with them in some venues and situations I encounter. That is, especially when I'm recording close to the stage. They don't have the sweet mid-range that expensive, more refined microphones have. But, the excessive brightness is tamed and I hear better low bass from recordings made with these microphones than I do from stock Chinese microphones. &#169 time between the notes... 2012-2019 All rights reserved.